Google’s Driverless Car – Is it our Future? You are here: Home » Personal Injury Law » Google’s Driverless Car – Is it our Future? Posted in Personal Injury Law | Comments Off on Google’s Driverless Car – Is it our Future? 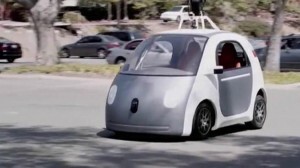 Google’s Prototype Driverless Car – Is it Our Future? Imagine being able to get work done on your daily commute, while your car acts as your chauffeur. Need to pick up the kids 10 times a day and feel like a taxi driver? Had a little too much to drink and need a ride home? Google may have the answer: meet Google’s prototype self-driving car. No steering wheel, no brakes, no gas pedal. Is this our future? For many, the idea of letting go of the wheel, literally, is a scary prospect, but if driverless cars like Google’s become the norm, it may have a profound effect on society as we know it. There’s no doubt that the convenience of a robotic chauffer is far-reaching. In fact, the software powering Google’s self-driving car is called Google Chauffeur. Think about how this technology will effect the lives of elderly people, blind, or disabled people who can’t drive. Aside from convenience factors, the self-driving car could also potentially have wide-ranging effects in reducing the number of car crashes on the roads. In fact, this was the impetus behind this project, according to Google engineer, Sebastian Thrun, who lost a childhood friend in a car accident. Since that time, Thrun has dedicated his life to creating technology to save lives. As the director of the Stanford Artificial Intelligence Laboratory, Thrun’s team at Stanford created the robotic vehicle Stanley which won the 2005 DARPA Grand Challenge. In May of this year, Google revealed its prototype self-driving or “driverless” car. Equipped with very sophisticated software and sensors on every aspect of the car, Google’s new prototype can literally “see” every single thing around it, obstacles, stop signs, stop lights, pedestrians. It navigates turns so well that it was even able to navigate the crooked Lombard Street in San Francisco. The potential for this technology to save lives is exciting. If you were involved in an accident, contact the Law Office of Kerri C. Smith, P.A. The information on this website is for general information purposes only and is not intended to create an attorney-client relationship. Nothing on this site should be construed as legal advice for any individual case or situation. © 2013 Kerri C. Smith, P.A.